Having control of your finances is crucial to living a self-sufficient life. 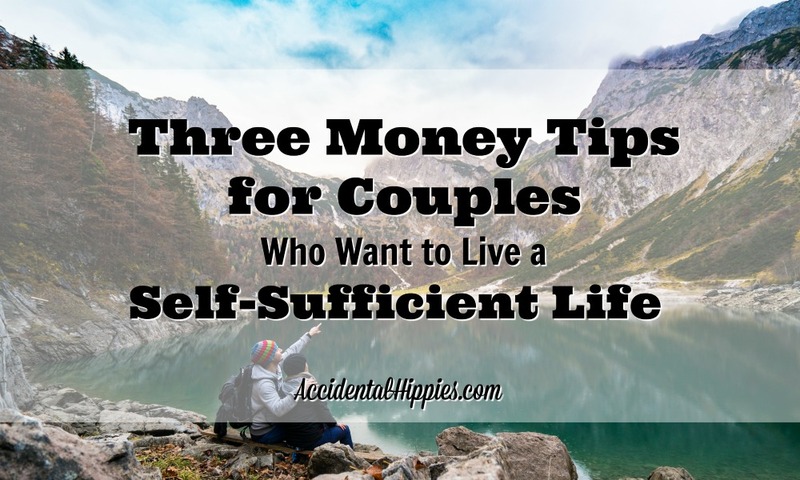 These three things are vital to us as a couple to get control of our money and build the homestead of our dreams. In 2014 we set in motion a plan to escape suburbia and build a home with our own home paying cash as we go. Perhaps you’ve found yourselves with similar dreams. Maybe you and your partner want nothing more than to escape to the woods and live off the land. Or you just want to live life on your own terms. Spend more time together. Escape the rat race. Live your values. I completely relate to this dream! However, living the self-sufficient life together is more than just gardening, chickens, or hikes in the countryside. It takes considerable determination and partnership to make your dreams a reality. We should know. We dug ourselves out of $24,000 in debt and are building a homestead with our own hands from scratch. And if you were to ask Mark he would without a doubt say that I am the nerdiest nerd in Nerdtown. I had Excel open before I even started writing this post! My mom said that even as a small child I was always making lists. I used to organize her shoes for fun. I CATALOGED MY “LIBRARY” OF PICTURE BOOKS WITH CARDS AND RUBBER STAMPS, PEOPLE. This has, of course, transferred into me being a bit of a nerd about our finances too. I’ve always been the Keeper of the Budget. Heck, I put together a little “feasibility study” of our potential budget including incomes and expenses before we even got married to see if marriage was the right decision for us at the time since we were still relatively young. When we started we knew just enough about personal finance to get us in trouble. Awww…we were just babies! We had no clue what was coming! We just sort of let our money float along that way for a long time without really having much of a plan. And you know where that got us? $24,000+ in debt and a sense of utter hopelessness. So while we were waiting out the rain as we worked on our homestead today, we ended up having a pretty deep discussion about how we got out of our toxic money situation and into a life of financial freedom. We kept circling back to the same ideas, and these are without a doubt the things YOU MUST DO IF YOU WANT TO WIN WITH MONEY AND LIVE A SELF-SUFFICIENT LIFE. No, I’m not talking about what funds to invest in or whether you should hoard your money in a mattress. I’m talking the relationship habits YOU need to build with each other so you can actually live your dreams. 1. Have an honest conversation about your biggest money goals and dreams. You think you’re talking with each other. You both share your aspirations, the things you’ve always wanted to do but never have, the things your parents used to do, and so on. But are you listening? Are you retaining? Are you making any attempt at all to think of your partner’s needs and, here’s the big part, make a connection from their needs to yours? ASK YOURSELF RIGHT THIS MINUTE: DO I KNOW MY PARTNER’S BIGGEST PROFESSIONAL AND/OR FINANCIAL GOAL? If not, you need to sit down together and have a deep and honest conversation where you both are receptive. Then you need to sit down together right this minute. 2. Take a measurable action towards one of those money dreams. Write down your biggest financial “daydreams” together and see where they overlap. What similarities do you have? Where can you make room for compromise? Then THINK: WHAT COULD WE DO TO MAKE THESE DAYDREAMS A REALITY? Case in point: Our homestead project was born out of a daydream Mark used to have very early on in our marriage. He had some green building books with loads of lovely photos of cob homes, straw bale houses, and of course cordwood homes. I thought they were nice, but I wasn’t deep into it like he was. But I WAS (and still am) passionate about saving money, making sustainable choices and reducing consumption, which these building styles all fulfilled in a way that conventional building never could. And the BIG overlap for us was that we both wanted to be debt free and financially stable enough that we could afford to work less, be with our future kids more, and travel the world with them. From there, we looked at what it would actually take to get us to that point. The fact that we’re already here at number 5 is a testament to how changing our conversations changed the entire course of our lives for the better. Discover what YOUR action items will be, form a plan, and DO IT. 3. Follow your financial action items and keep communicating about them. Okay, so you sat and had a lovely talk. You set some goals. Great. Now you have to do this crazy thing called FOLLOW THROUGH. Having meetings with each other regularly. If you like a structured schedule at home, try meeting after Monday night dinner, or 5:00 every 1st and 3rd Thursday. It doesn’t matter when exactly as long as you commit to it. Or, if you’re more the “let it roll” type with your at-home schedules, you might be more inclined to have these discussions in the car, or while taking hikes. Again, just commit to communicating. We tend to do a combination of these two. Usually, Mark will suggest, “Hey, we need to sit down and talk about the numbers for this week. Can we set aside some time after we get Little Man down for bed tonight?” And that works for us. It works mostly because he knows I’ve already been looking at the Excel files and I know he’s been keeping track of all the receipts. We get together and talk at times that work for us and our odd musician/teacher schedules. When you have these meetings, don’t forget to listen to each other. This is a time to be really attentive to each other and see what is happening in your finances for what it is. It isn’t a time to place blame, find fault, or try to commandeer the situation. I’m fortunate to have a spouse who sees this as an equal partnership and I value that immensely. This is essential to a healthy financial partnership. You are both equal and both bring your aspirations and values to the table. LISTEN to them and together you can craft and maintain an actionable plan. If you need help, I suggest downloading these Budget and Goal Setting Worksheets to help you out. I’d love to hear from others about what you’ve done about money in your relationships. Maybe it was great! Maybe it was awful! Whatever it was, I’d love for you to share about it. Let me know in the comments below, or hit me up on Facebook and Twitter. This was such a needed read! We are in year 3 of homesteading but have not done it debt free and just started an aggressive plan to get there. I feel like we talk about goals but in no way is it structured, and I am realizing now that we probably aren’t really listening to eachother sometimes…..we have way too many moments where Mr Free Spirit buys supplies from the hardware store on his way home for a project that I had deemed low priority. I really like your suggestions and since we live an hour from town maybe we can start using the drive for something more productive than car dance parites. That’s so wonderful to hear! I’m glad it helped you. Good luck to you both in your journey! This is so wonderful. I love reading about your journey and I love seeing and hearing about couples that work together to make it happen. Good for you guys and thanks for sharing with all of us out in the world! It’s truly inspiring. Thanks so much for the kind words! We really hope that sharing our journey and knowledge can help others on the same path. Good luck to you!